Rachael is one of our longest serving female members having joined the fledgling girls’ section as an 11-year-old in 2010. In 2012 she was part of the team that won the Lady Taverners Softball competition at Garboldisham but, by 2013, she was a member of the County girls’ U13 squad. She played for Melton U13s in the South Norfolk Community League in 2014 as well as for Melton Ladies in 2014 and 2015. 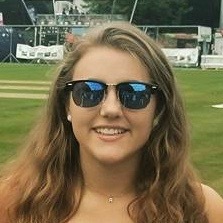 Last season, with no Ladies team to play for, Rachael was a regular in Martyn Moye’s U15s squad and this year – her final one before going travelling and then, presumably to university – she is likely to be one of the more experienced players in the Ladies squad and is also looking to play senior cricket for the C or Sunday A Teams. Mum Jill is very supportive of the club and, for many years, has assisted with registering all the juniors on Friday nights and, this season, Rachael is a member of the Women & Girls’ Sub-committee, while dad, Andrew, always helps out at Cricketforce. Rachael is in her final year of A Levels at Wymondham High School.